Stem: 2--8 dm, 0.8--2 mm diam. Leaf: proximal sheaths mostly glabrous; blade 11--30 cm, 2.5--4.2 mm wide. Inflorescence: 11--15 cm, dense. 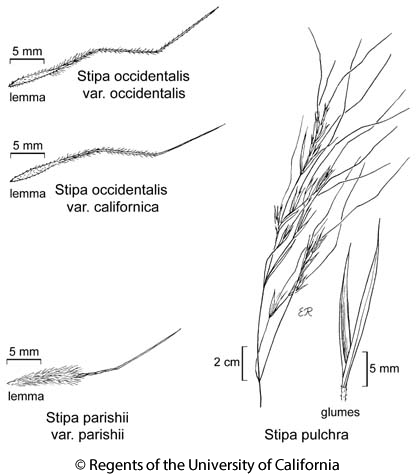 Spikelet: glumes 8--15 mm, narrowly lanceolate; floret 5.5--6.5 mm; callus 0.2--0.8 mm, acute; lemma 1.2--2 × palea, densely hairy throughout, awn 15--35 mm, bent 1 ×, persistent, generally scabrous proximally. Ecology: Dry rocky slopes, scrub, pinyon/juniper woodland; Elevation: 700--3050 m. Bioregional Distribution: s SN, TR, PR, W&I, DMtns; Distribution Outside California: to Utah, Arizona, Baja California. Flowering Time: Apr--Aug Note: Other variety in central Nevada, western Utah. Citation for this treatment: J. Travis Columbus, James P. Smith, Jr. & Douglas H. Goldman 2012, Stipa parishii var. parishii, in Jepson Flora Project (eds.) Jepson eFlora, http://ucjeps.berkeley.edu/eflora/eflora_display.php?tid=91921, accessed on April 19, 2019.
s SN, TR, PR, W&I, DMtns; Markers link to CCH specimen records. Yellow markers indicate records that may provide evidence for eFlora range revision or may have georeferencing or identification issues. Purple markers indicate specimens collected from a garden, greenhouse, or other non-wild location.